We offer handicap accessible picnic tables a variety of styles, sizes, and materials. You can even order many of our ADA picnic tables in various colors to blend with the rest of your outdoor picnic table setting. Your handicap accessible picnic tables will provide years of outdoor dining enjoyment. Our customer service representatives can assist you with choosing the right ADA table material and design for your commercial application. 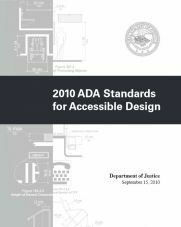 Section 226.1 of the ADA standards requires that where dining surfaces are provided for the consumption of food or drink, at least five percent of the seating spaces and standing spaces at the dining surfaces comply with section 902. In addition, where work surfaces are provided for use by other than employees, at least five percent shall comply with 902. Section 902.2 requires the provision of accessible knee and toe clearance.